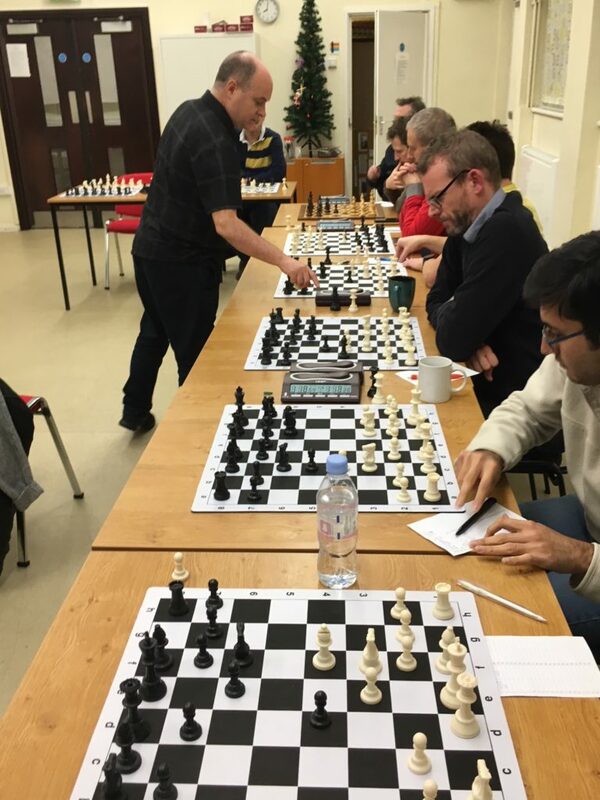 Hammerites, you can read a beautiful write-up of our Simultaneous against GM Keith Arkell below, but first a quick reminder of our annual Blitz Tournament tomorrow evening. The John R White Blitz Tournament is in its third year and we’re kicking things off at the Anvil (aka Lytton Hall) tomorrow night from 7.30pm. First up is the small matter of our annual awards for our best players, tournament winners and other contributors to the club – always great to give a small gesture of appreciation! This will be followed in short order by the handicap Blitz tournament, named in memory of our former Chairman and life-long member, John R White. It’s a fast & furious display of attacking chess, where gradings and form go out of the window, as the ridiculously quick games throw up blunders and sacrifices at every turn. Don’t miss it! We’ll also be laying on snacks & drinks to help everyone get into the festive spirit! It’ll be a cracker!! Not bad for a Brummie lad who learned chess at the age of 13! However, all these achievements pale into insignificance thanks to a chance and momentous encounter on the 12th December 2016 in a pub called the Albion, situated in Hammersmith. Keith, relaxing after a hard days chess at the London Classic, ran into the Hammer posse indulging in their passion for beer (and chess). Contact was made and what followed will enter folklore. Yes, he agreed to do a simultaneous at the Anvil in December 2017…… read on! 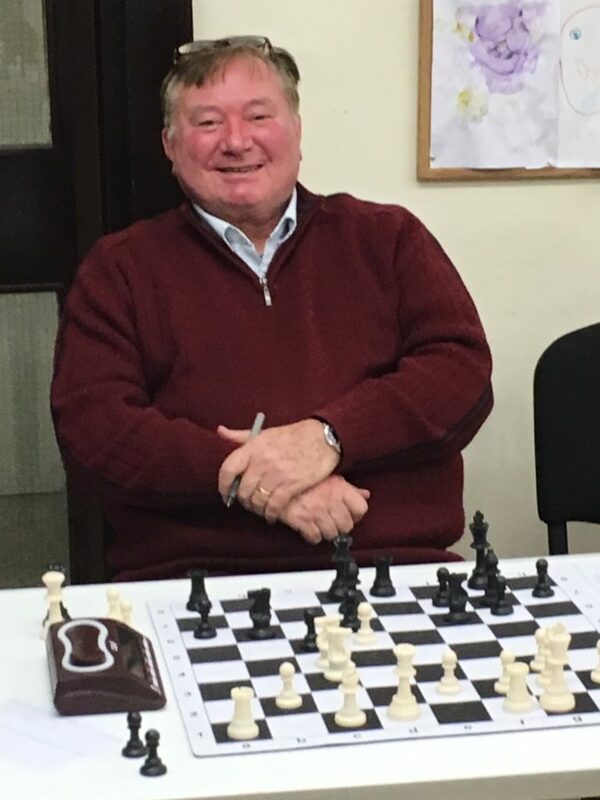 First of all, for the record, Keith “The Legend” Arkell is not only a great chess player, he is really good company, a beer connoisseur and an all-round first class human being. Due to flu and Christmas commitments, the Hammerite contingent was much depleted, however we did mange 14 boards. The Legend, in the spirit of the occasion, decided it was best to do a clock simultaneous. The clocks were set at 80 minutes – meaning that on average “The Ledge” would only have less than 10 minutes per board, A serious challenge alone, but on top of that he gave his opponent choice of colour. The rest of the Hammer posse consisted of Wily, Spock, Brexit, Clueless, Pickle and the Great Dane. Plus a guest for the evening called A.N.Other. Brexit was on wine duty and tried to impair the Legend’s powers by giving him a bottle of Soave to aid his progress. Excellent idea, but did it work? Brexit also gave the rallying cry to the Hammer troops urging us all to rise to the challenge and help each other. For the greater good was the mantra we would all adopt! On Board One the Ledge faced the balls of steel chess approach from Wily. An unbelievably fascinating game followed that ultimately ended in the rare scenario of King and Queen v King and Rook, with the Legend in the driving seat. Wily deployed all his powers but could not withstand the inevitable loss. Indeed, it could be said Wily was just “Out-Wilyied” (Hammer yet again expanding the English language). Acme Industries could not have planned it better. On Board Two Spock struggled valiantly and with huge invention nearly saved the game. Unfortunately, he had the Bad Bishop versus Good Knight situation and two vulnerable advanced pawns. The Legend smoothly converted. Hammer 2-0 down. Board Three Brexit, unlike real political life, was playing a Peaky Blinder. He was in control of his destiny and everything seemed in order. Unfortunately, when you deal with a Brummie/Devonian chess technocrat they have a way of lulling you into a false sense of security. Brexit thought he had the advantage but the Legend had prepared a devious tactical pin. It had all been so promising…. Hammer 3-0 to the bad. Board Five had Pickle, playing white and his preferred London System, win the exchange and achieve a definite edge. Although, the position was hugely complicated with tactical possibilities abundant. This caused Pickle to use up huge amounts of time and in the end time pressure told and one of the tactics struck home. Hammer now at 4-0 down. The next few boards saw RU Serious, Vintage, Eco Prof, Sorted and Gandalf all take a Hammering. RU Serious and Sorted played well beyond the point of no return to give the other Hammerites extra thinking time. Their efforts were not in vain, but more on that later. The other games I cannot comment on as my game totally absorbed my time. The tale of the tape now stood at 9-0 to the Legend. The best moment of the night was to see Mad Dog take the Legend to the line. Although Keith had it all under control his courtesy and recognition of Mad Dog’s efforts were spot on post-match. He really is a gentleman. Mad Dog was over the moon with happiness. However, the scorecard moved relentlessly onwards to 10-0 in favour of The Legend. A guest of the night whose name escapes me, he shall be known as A.N.Other, also succumbed at the hands of The Legend. The Ledge was cruising at 11-0. Arriving late but always up for a fight was our Top Dog – the Great Dane. With only forty minutes to play with, this was not his preferred format. He fell for a mate and now The Legend was looking at a whitewash of the Hammer Posse. Thankfully, the honour of the Club was preserved by T-Bone and your correspondent, Clueless. T-Bone was under pressure and the Legend misplayed a sequence of moves that allowed T-Bone to pounce with a mate in one. Analysing the position later both players agreed The Legend definitely held the advantage, but a win is a win. Hammer had stopped the rot. Finally, to Clueless. Playing Black and a Benoni, Clueless took the Legend on in a no-holds-barred contest. There was going to be a result one way or the other. Fortunately for Clueless, Caissa decided the fates should fall his way. With only 90 seconds left on his clock Clueless accepted the Legend’s resignation. To be frank I think he felt he morally owed me – bribes of accommodation, food, beer, free wi-fi etc. undermined the determination of the Legend. Having said that, I will take the win regardless. My first, and probably only, triumph against a GM. The evening finished with a win for the Legend 12-2 in his favour Considering his exertions at the Classic and social enterprises over the past 10 days, the score line was amazing. His durability and energy are incredible. The evening ended up full circle with a return to where it all started – The Albion. The conversation was great and the Legend stated for the record that whenever he is in London and there isa match on, he will turn out for Hammer! This commitment was met with great enthusiasm by the Hammer crew and reinforced our good opinion of him. The Legend has chosen Hammer as his London home. Enough said. Happy Christmas one and all and especially to GM Keith Arkell – now a Hammer Legend. Clueless, you forgot to mention that Keith generously offered us a choice of colours. I believe you were black. I missed a clear one move win. I lost on time (!!!) and the final position was more or less equal. Great evening of chess. Thanks to Keith for his impressive performance and Clueless for organising it. It was absolutely wonderful to meet all of you. The perfect chess club! and I’m very happy to have got myself connected with it. Love the write up, but I think Clueless is being too generous about my play. He himself simply outplayed me from …Qb6+ onwards, and, for example, good ole’ Mad Dog matched my play all game, until just making one mistake right at the very end. Anyway, enough about the details. The good natured banter, and general air of goodwill at the club, and followed by just a great great hour at the Albion left me in the best possible spirits and made it, from my perspective, a simul to remember. Thanks loads to all of you and especially to Clueless for setting the thing up and taking such good care of me. Very best seasonal greetings ( AKA Merry Cimbo!) and Happy New Year to all!